PDQWorks verifies that models created in SolidWorks will satisfy the quality requirements defined by the SASIG group (VDA 4955, AIAG D-15, GALIA, ODETTE, JAMA). You also define your "own quality standards" to satisfy internal requirements and manufacturing capabilities of your organization. 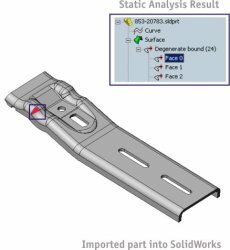 The model quality and conformity can be verified (dynamically or statically) at any stage of the design process in SolidWorks. Dynamic Verification checks the model conformity during the design process in SolidWorks. The quality status is updated dynamically allowing the user to rollback operations causing a quality loss. 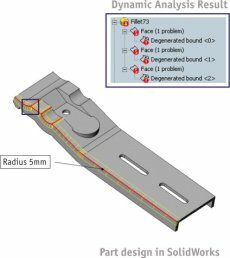 Static Verification can be applied during any stage of the design process or on odels imported into SolidWorks model from other CAD systems. Quality check can also be applied to selected parts instead of the whole model. PDQWorks verifies that models exported from SolidWorks will satisfy the quality requirements of the receiving CAD/CAM systems (CATIA, Pro/E, UG, IDEAS, SolidWorks, etc). This makes the PDQWorks an integral part of the workflow that requires strict compliance with the given quality criteria. For example, consited a CATIA -> SolidWorks -> CATIA workflow. Imported CATIA parts are modified in SolidWorks and verified with PDQWorks before exportin back to CATIA. This means that the model conforms to the quality criteria imposed by CATIA. With PDQWorks SolidWorks designers can get their models right the first time and avoid costly redesign problems. This is critical for SolidWorks users working with the automotive and aerospace industry, requiring high interoperability levels with CAD systems e.g. CATIA. 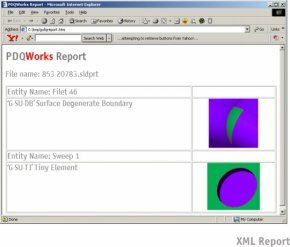 Detailed XML reports are automatically generated using SASIG group terminology for error classification and model entity definition.